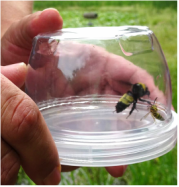 My interactive pollinator walks teach participants how to look for, and gently capture (and release) insects. Participants get an up-close look at each insect captured and learn about their biology, their contribution to the pollination of flowers, or their role as a beneficial insect. My pollinator walks are suitable for people of all ages and abilities. Walks are limited to 20 people. For more information or to schedule a pollinator walk, please email me (contact@pollinatorsnativeplants.com).